Kia has scooped the What Car? Ultra Low Carbon Award for the environmental contribution made by all its latest new car introductions. Praised for its "dramatic progress" in launching cars with the "lowest average CO2 emissions" over the last 12 months, Editor in Chief, Chas Hallett said Kia was making "leaps that catch us out!" What Car? 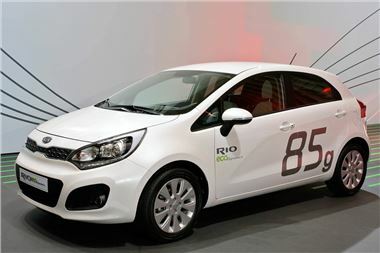 singled out the all-new Kia Rio with its class-leading 85g/km CO2 figure - the cleanest non-electric vehicle in the world - at its annual Awards at London's Grosvenor House Hotel. But the magazine had previously praised the also all-new Picanto back in the summer at its Green Awards ceremony - on the eve of the EcoVelocity Show that focused on environmentally-friendly technologies - naming it Green Supermini of the Year. Hallett commented: "Kia models that were launched in the past year have the lowest average CO2 emissions of any launched in the past 12 months. Best of all Kia's engineers have managed to achieve these figures without resorting to expensive hybrid technology." Paul Philpott, Chief Operating Officer of Kia Motors Europe received the award and said: "Kia has been striving over recent years not only to deliver exciting, attractive, high-quality cars but also to deliver real benefits to customers in the form of cleaner technologies that don't carry a price premium. We are delighted that What Car? - one of Europe's leading consumer magazines - has recognised our efforts." Michael Cole, Managing Director of Kia Motors (UK) Limited added: "This praise from What Car? caps off a fantastic year for us when so many people in the media have recognised the great strides we have made in terms of design, technology, quality and value. Our trophy cabinet is groaning - but I am delighted to find room for this honour."